Your registration is done by sending the online application or register at one of our agencies. Your registration is non-binding and without any commitment. We will contact you and work out a prospective program for you will all services, dates and costs. Once you let us know that you want to book the proposed program we will confirm the program data, booked services and corresponding fees. For final booking we will demand a down payment in form of the registration fee or partial fees according your program. By paying the registration fee you accept our terms & conditions and program rules and confirm the offered services and corresponding fees. The registration fee has to be wired by Western Union, by PayPal, to one of our or our agent´s bank accounts or other methods indicated by us. The participant has to add money transfer fees or bank commissions. Pasantias Argentinas will send you a Confirmation of Enrolment, Accommodation Guarantee, Internship/Volunteer/Work Placment or Farmstay Placement Guarantee and/or a Voucher of all booked services. You will receive detailed arrival information, accommodation details etc. by time before departure to Argentina. The rest of the total program fees has to be paid before start of program, at the latest on the first day of classes or on arrival. Partial payments will not be accepted. Payments has to be done by bank wire to one of our or our agent´s bank accounts, by Western Union money transfer, by PayPal, by other payment methods indicated by us or in cash in US$, Euro, British Pounds, Swiss Franken or Argentinian Peso. The participant has to add eventual bank commissions or money transfer fees. If you require that some services have to be organized before your arrival to Argentina (e.g. internship placement, farmstay placement), advance payment of the corresponding fee can be agreed. Change of reservation: changes of reservation after paying the registration fee (booking) could be accepted without no obligation by Pasantias Argentinas. In case of change of reservation Pasantias Argentinas confirms the new program dates. For every change of program which leads to a shorter duration of program or less program fees a change of reservation fee of Euro 50,- will be charged. In case of cancellation the registration fee will not be returned under no circumstances. Also the accommodation reservation fee (generally the first week of accommodation) cannot be refunded. Cancellations 4 weeks prior start of program: all forwarded other fees will be refunded. Cancellations 2 weeks prior start of program: 50% of all forwarded fees will be refunded. Cancellations less than 1 weeks prior start of program or no show: no refunds for stays less than 8 weeks duration. Refunds for longer stays will be considered individually. After the start of the program no refunds will be made. Only in cases of personal emergencies, with proper notification and thorough documentation, Pasantias Argentinas review claims and be able to offer a partial refund. Placement fees (if charged/if applicable) for internship, volunteering, work, farmstay and accommodation are for ONE proper placement. Once the placement was confirmed, there exist no right for refund or another placement. 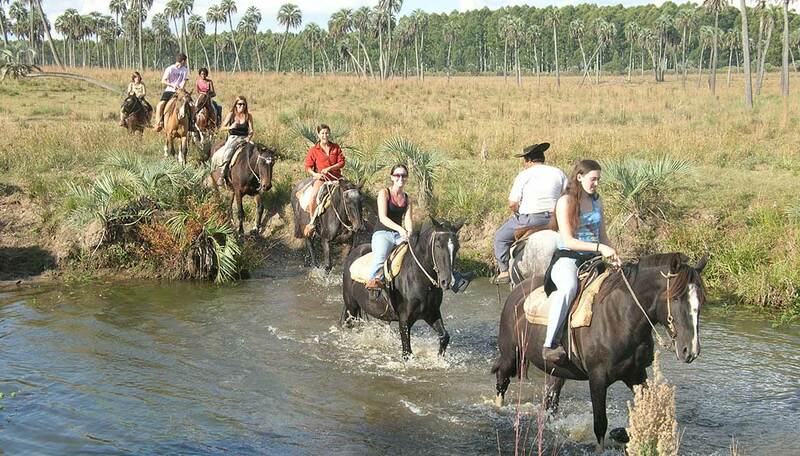 Intership/volunteer/job/farmstay etc placements: Pasantias Argentinas does not offer and does not guarantee a specific commence date, content, duration, performance or the success of the internship/volunteer project/job/farmstay etc. If no placement fees are charged, Pasantias Argentinas will try voluntary (ex gratia payment/ad honorem) to place the participant into a suitable position/internship/volunteer project/job/farm etc. The participant has to assist the local staff within the placement process, especially with his conductance, interview availability and the provision of all required documents. Pasantias Argentinas, its principles, owners, members or hired staff members cannot be claimed for any damages suffered resulting by carrying out or not carrying out activities on the training/internship/volunteer project/job/position/farm etc, by not providing voluntary (ex gratia payment/ad honorem) services/performances, by travelling to or through Argentina, by staying in Argentina or by transmitting/providing incomplete or incorrect information. The participant is responsable for all affairs regarding his arrival to Argentina and departure from Argentina, flight and transportation arrangements, insurances, health and health prevention, visa/ immigration regulations and personal/educational/sholarship etc. affairs in his home country which might be affected by his stay in Argentina. The participant will come to Argentina and stay in Argentina on his/her own risk! The accommodation is booked weekly and is available from Sunday to Saturday. All programs start on Monday and end on Friday. The participant should arrive on the weekend before start of program and leave the accommodation on the Saturday after end of the program. Extra nights for advanced arrival or prolongation of stay will be charged. No classes or services will held on national or public Argentinian holidays. Classes not held for other reasons will be rescheduled and held on other days. If group classes in the Spanish Language Course is booked and no other student of comparable ability will participate, there may be a reduction of class hours with the compensation of individual classes.